Colleen Spees was looking for a way to extend the life of her family tree. Cancer was prominent in her family, and growing up, she attended more funerals than weddings. Her older brother died of cancer at age 15, and when her sister was diagnosed with breast cancer, the family looked to genetic testing for answers. The results weren’t good. While Spees’ test results were negative, her sister and many family members tested positive for Li-Fraumeni Syndrome, a genetic mutation that greatly increases the risk of developing several types of cancer. Spees was looking for a glimmer of hope. She found it in her own profession as a dietitian. She knew research showed 90-95 percent of cancer risk is associated with environmental exposures, and about 55 percent of that is related to modifiable behaviors including body fat level and physical activity. Lifestyle behaviors could be modified to delay the onset of cancer, reduce the aggressiveness of diagnosed disease and decrease the risk of other complications. Harvesting produce are, from left, Chris Humston, Eleanor Hansen, Libby Hunt and Jake Hunt. 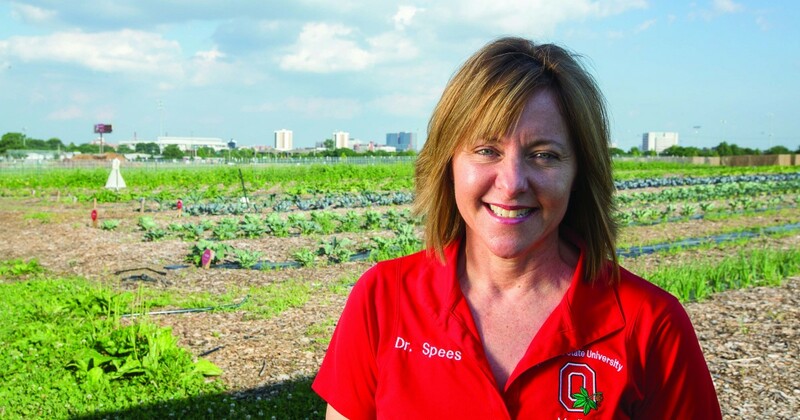 Shortly after Spees got her doctorate studying nutritional genomics and cancer at The Ohio State University, the university started the Garden of Hope program at the Waterman Agricultural and Natural Resources Laboratory, a 261-acre learning and research facility located on the Columbus campus of the College of Food, Agricultural, and Environmental Sciences (CFAES). 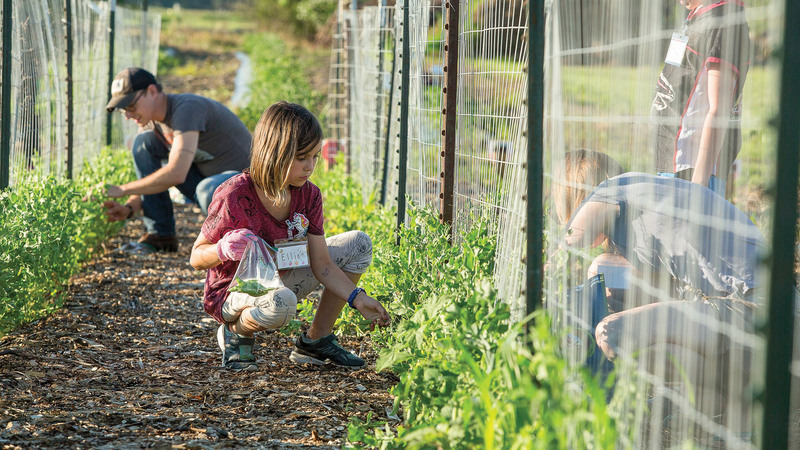 Every week, cancer survivors treated at Ohio State and elsewhere harvest fresh produce in the 2.5-acre garden to promote healthy diets and reduce the risk of cancer complications. The program is a collaboration of Ohio State’s Comprehensive Cancer Center, College of Medicine, the JamesCare for Life program and CFAES. Spees heard how Garden of Hope participants felt physically and mentally better after spending time on what she calls an “urban oasis” and consuming nutrient-rich vegetables like kohlrabi, beets, beans, and kale. As an associate professor in Ohio State’s College of Medicine, Spees wanted research to back up those anecdotal stories. Recently, Spees was watching one of those teachable moments in a room filled with children and their caregivers. A child excitedly pumped his arms in the air and yelled, “Veggie victory!” in a dice game that teaches which vegetables are starchy (potatoes, corn and peas) and which are non-starchy (broccoli, peppers and kale). After a brief nutrition lesson, the children played with their food by using vegetables to make faces on whole-wheat pitas. Enjoying the physical fitness part of the program are, from left, Melic Williams, Logan Hall, student volunteer Jeff Laubert, Jordyn Wilson and Ashley Hernandez. Then came the favorite part — going outside to harvest fruits and vegetables in a separate set of gardens created for Spees’ clinical research studies. Over the years, Spees has conducted several nutritional research studies for young and old alike, including Harvesting Hope 4 Kids for survivors of youth cancer. 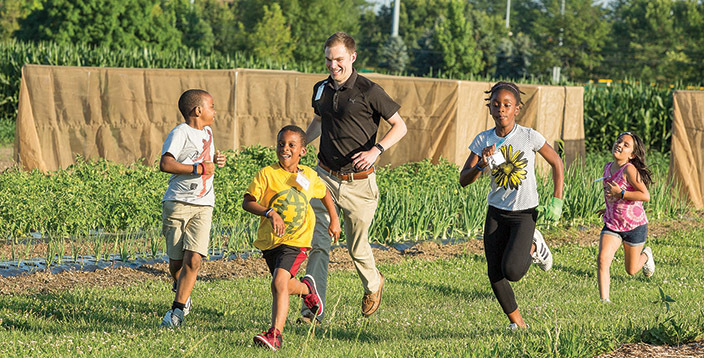 “We find kids become more adventurous eaters when they touch their food, discover where it comes from and learn about farming, and experience harvesting this beautiful produce,” Spees said as she watched Ohio State student Jeff Laubert lead the kids on a sprint around the gardens for the physical activity portion of the program. The children live primarily in low-resource areas of Columbus that have limited access to fresh produce. The five-year study is funded by a $1 million U.S. Department of Agriculture childhood obesity grant. The program’s goal is to teach the importance of adhering to evidence-based dietary and physical activity recommendations to promote health and wellness. Cancer survivor Ed Price gushes about his experience at the research gardens last year, saying the cooking demonstrations and educational pieces were excellent. He was part of a research project that compared a mostly plant-based diet with one that included lean cuts of meat. 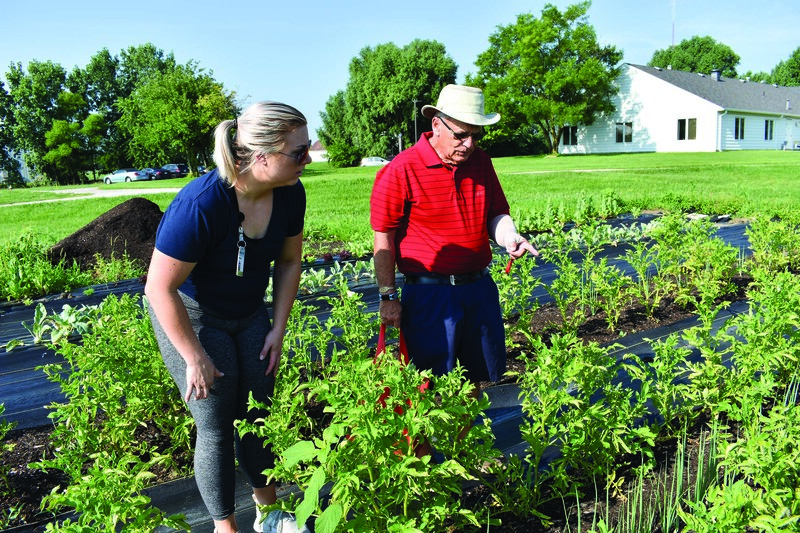 Ohio State University student Monica Schroll helps cancer survivor Ed Price pick out vegetables at the Garden of Hope. Price, who was treated for cancer in 2016, also goes weekly to the Garden of Hope, which is so popular that the organizers had to impose a two-year participation limit so more cancer survivors could participate. On a recent sweltering summer day, Price studied a board describing what’s in season before maneuvering through the garden lined with black plastic cloth paths wide enough for wheelchairs. Ohio State student Monica Schroll, who is working on her doctoral thesis on the impact of modifying nutrition prior to chemotherapy for patients with colon cancer, was there to assist Price. After marveling that a type of marigold is edible (a variety called Lemon Gem), Price plucked green onions, new potatoes, kohlrabi and romaine lettuce from the ground. Interacting with cancer survivors and being in touch with nature is inspiring for the student volunteers who get to take home part of the bountiful harvest. More importantly, they get an experience that’s priceless.